The Coast Guard is searching for a possible missing boater after an empty vessel was found approximately one mile west of Mission Bay, in San Diego, yesterday. Missing is Garrett Ferguson, 36, from Huntington Beach, California. His identification was left aboard the abandoned six-foot dingy. 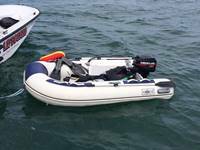 At approximately 11:50 a.m. yesterday, watchstanders at Coast Guard Sector San Diego's Joint Harbor Operations Center received a report from Mission Bay Lifeguards stating they had found the six-foot dingy approximately one mile west of Mission bay with no one on board. Anyone with any information with regards to Ferguson is requested to contact the JHOC at 619-278-7033.